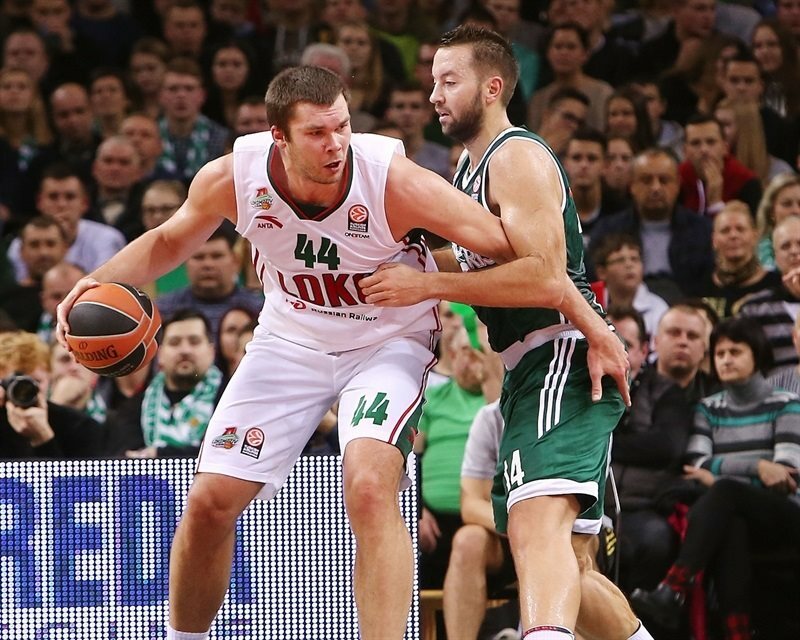 Lokomotiv Kuban Kransodar held on for an important road win at Zalgiris Kaunas 74-76 on Friday. 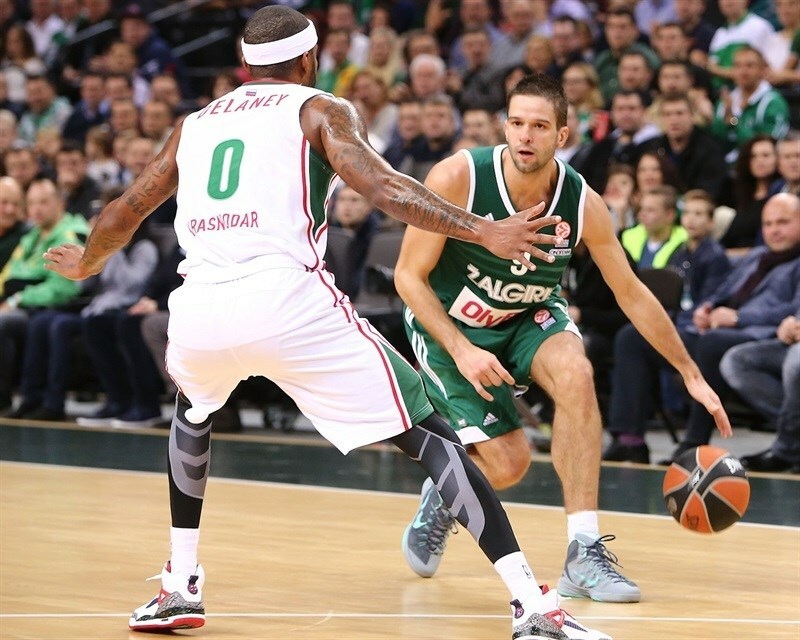 The victory saw Lokomotiv improve to 2-0 in Group C, while Zalgiris dropped to 1-1. The two teams traded blows from the start, with a high-scoring first, and a low-scoring second quarter. 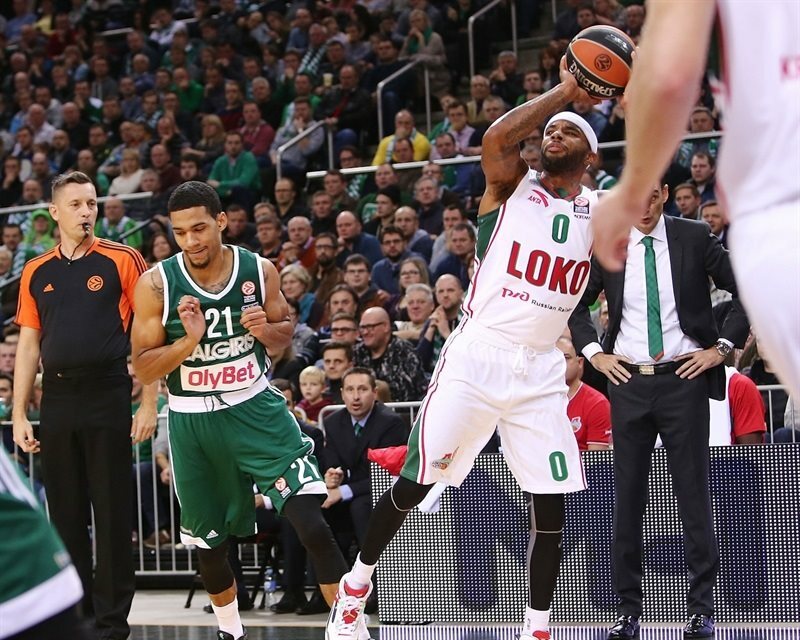 Lokomotiv never trailed in the second half, and led by as many as 9 behind baskets from Malcolm Delaney and Kyrylo Fesenko. 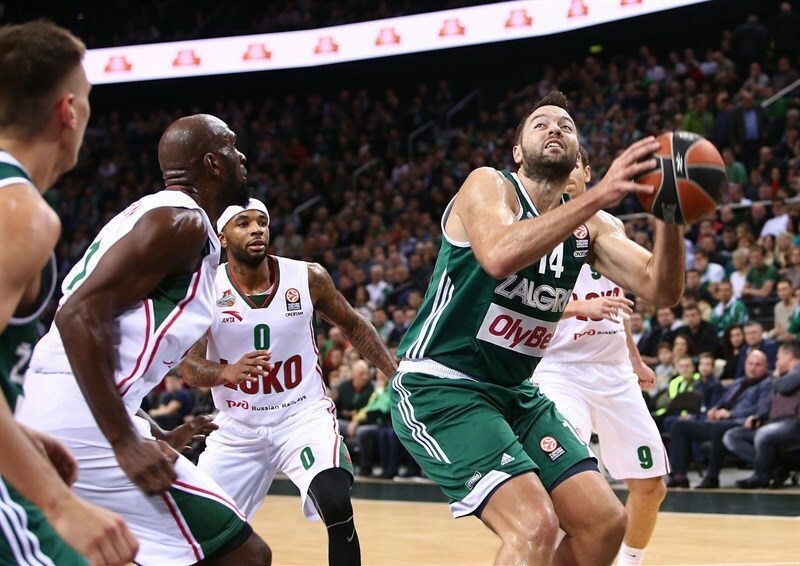 But Zalgiris rallied behind Mantas Kalnietis and Ian Vougioukas to tie the game at 74-74 with 12.5 seconds on the clock. Victor Claver put the visitors back in front with a pair of free throws and Kalnietis missed a potential game-winner at the buzzer. 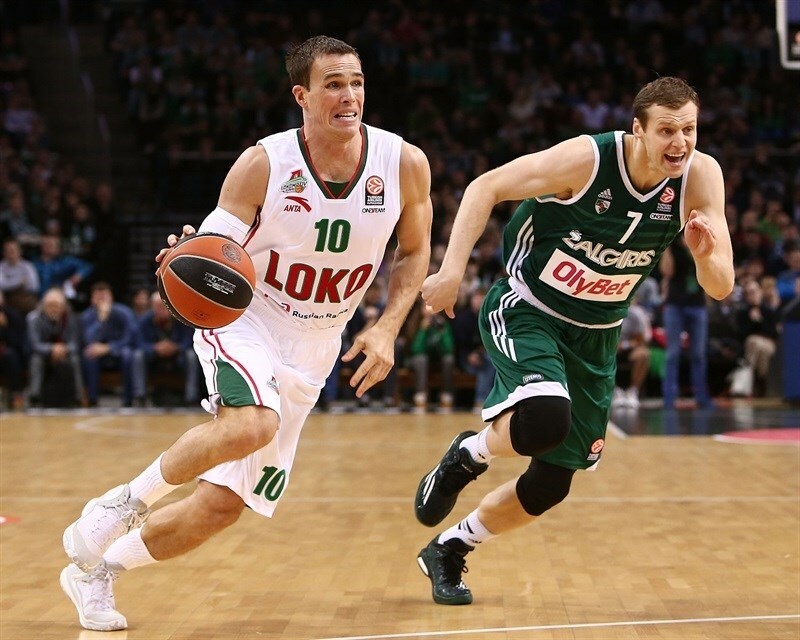 Delaney scored 21 points in victory, Ryan Broekhoff netted 12 and Claver finished with 12 points for Lokomotiv. Vougioukas paced the hosts with 22 points, Renaldas Seibutis scored 9 of his 11 points at the start of third quarter, while Kalietis and Olivier Hanlan scored 9 apiece in defeat. 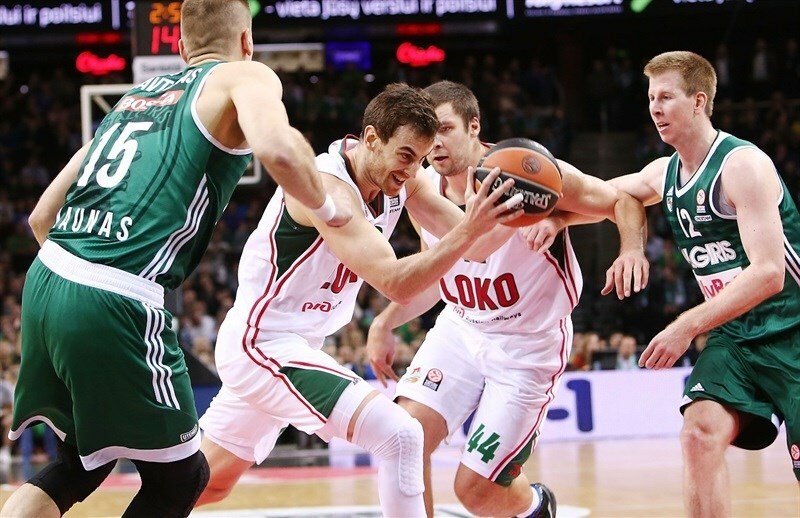 Vougioukas scored a reverse layup on the opening possession of the game, while Broekhoff opened Lokomotiv’s account from way way downtown, banking in a triple to beat the expiring shot-clock. Brock Mottom and Claver traded triples, and Vougioukas followed with a three-point play for an 8-6 lead. Lokomotiv’s Delaney drove right down the lane for an easy layup, but Vougioukas kept Zalgiris in front, first with a dunk after a pass from Mantas Kalnietis, then with another three-point. A three-pointer from Kalnietis extended it to 16-10 after only four minutes of action, but Delaney drained one of his own from downtown. Evgeny Voronov scored a runner for the visitors, and after Vougioukas scored from close range in heavy traffic, a triple from Brokehoff tied it at 18-18. Lokomotiv was 4 of 4 from behind the arc, and a tip-in from Claver and a fastbreak dunk from Broekhoff gave it a 4-point cushion. But Hanlan knocked down a wide-open three from the corner for Zalgiris and soon added a basket from close range, before dishing an assist for an Edgaras Ulanovas triple and a 26-24 edge. 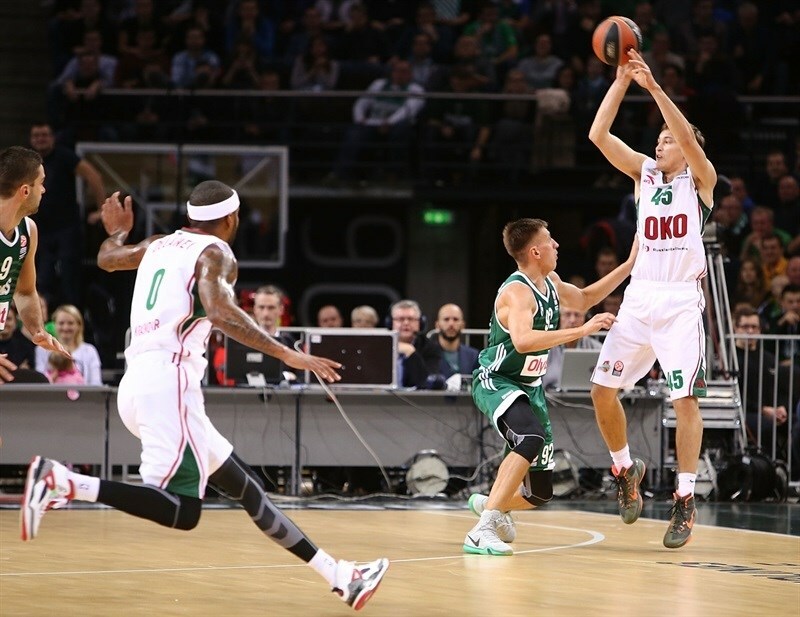 Hanlan added a pair of free throws to the run, and Martynas Pocius capped a 13-3 spurt with a triple – the fifth three-pointer as many different Zalgiris players. To end the high-scoring quarter, Delaney drove the lane to make it 31-27 after 10 minutes. 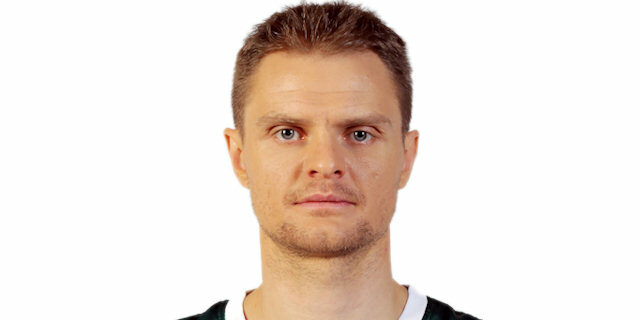 Sergey Bykov made a runner to start the quarter, but Pocius bettered it with a three-pointer. Bykov was successful on another drive to the basket, this time with a floater, before Dontaye Draper buried a three-pointer to tie the game. Andrey Zubkov’s runner pushed the visitors in front 34-36. 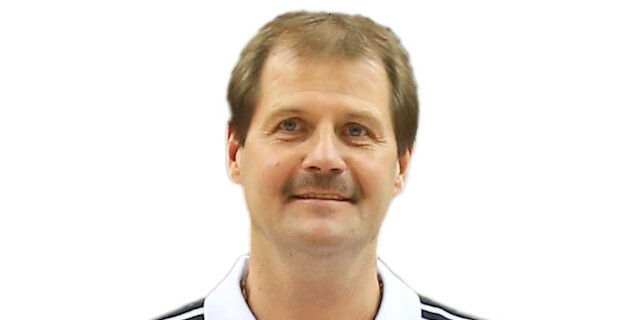 More than two minutes passed before the next basket, a put-back from Kyrylo Fesenko, but Motum sank a floater and Renaldas Seibutis used 2 free throws to tie the game. But the visitors regained the lead through Chris Singleton’s three-point play, 38-41. Delaney made a put-back to increase the gap to 5 before Pocius drove for a layup and made it 40-43 at halftime. Claver and Vougioukas traded baskets inside before Claver nailed a triple for a 42-48 lead. Seibutis had an easy layup and then drove coast-to-coast, but Delaney knocked down a long jumper for a 46-50 edge. Fesenko scored inside and after Seibutis hit a long jumper, Fesenko went inside again. After a timeout, Seibutis nailed a triple for his ninth consecutive point, but Broekhoff drove for a layup to keep Lokomotiv two possessions ahead. Draper made a pair from the foul line and then assisted Fesenko for a monster dunk and a 51-60 advantage. After a timeout, Vougioukas scored from close range for the first Zalgiris basket in the quarter by a player not named Seibutis. Kalnietis followed with back-to-back long jumpers, cutting it to 57-60. Jankunas’s triple started the quarter and tied the score at 60-60. Delaney hit a long off-balance jump shot, and after Hanlan made a tough fade-away shot, Broekhoff hit a three-pointer to make it 62-65. Vougioukas easily scored inside in a mismatch against Delaney, but a minute later Delaney hit a pull-up triple and then Zubkov nailed a triple, too, for a 64-71 cushion and resulting in a Zalgiris timeout. Motum cut the deficit with a basket-plus-foul, but Voronov banked in a short runner for the visitors. A back-door pass from Ulanovas for Kalnietis resulted in an easy baseline layup that helped the hosts get within 70-74. 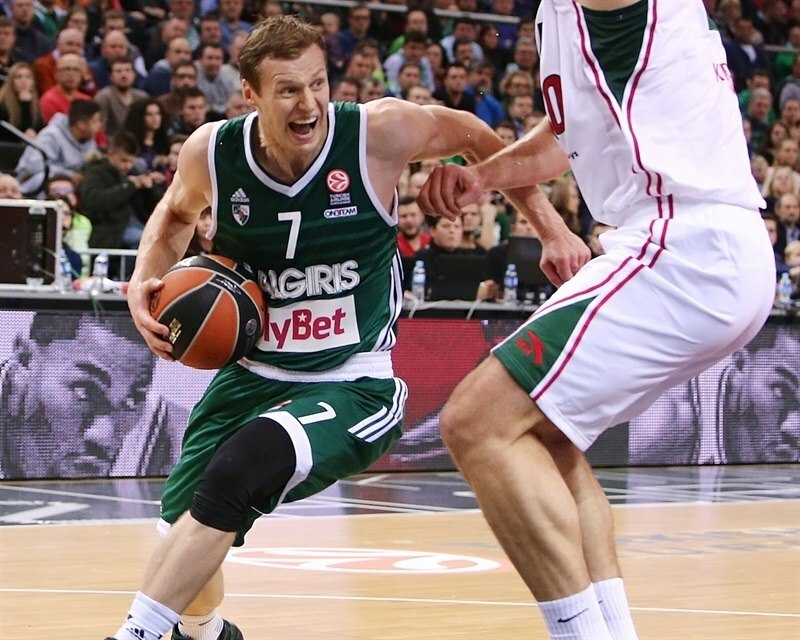 That remained the score with 50 seconds left and a Zalgiris having the ball. Vougioukas drove the baseline for a layup and then Delaney threw the ball out of bounds with 20 seconds remaining, giving the hosts another possession. Hanlan found Vougioukas all alone for an easy dunk that tied the game with 12.5 seconds left on the clock. 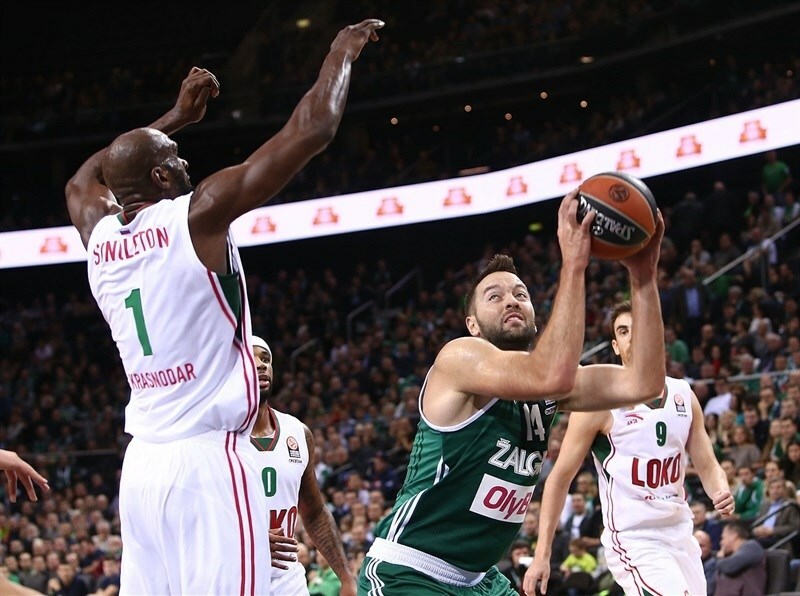 Claver made 2 free throws with 11.6 seconds to go, and with 74-76 on the scoreboard, Zalgiris had a shot to tie it or win. Kalnieits took the ball into his hands, but missed a three-point shot at the buzzer. 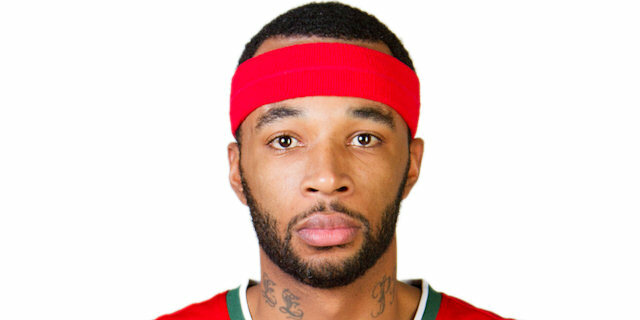 "Lokomotiv Kuban won a difficult game. They made tough shots at decisive moments and we didnt. We had to play smarter in the last posession. In the second quarter we made eight turnovers, which limited our offense. " "With all this atmosphere, we needed to be focused. Zalgiris did an excellent job on defense, they forced us to make many turnovers, sometimes without any pressure, sometimes it was our mistake. But finally, we won this game, which was very important for us. The players showed character and we are happy about this. 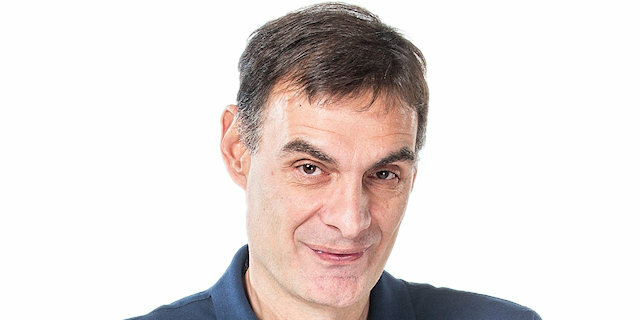 Every game in Euroleague is very , very difficult, very tough, and you have to prepare the team possession by possession. Finally, tonight, we are happy." "We had problems with rebounding and defense. They took a 10-point lead in the third quarter. The battle was intense, but they made tough shots and ran away. Small details decided the game. Especially, at the end of the game when everything depends on one shot. It’s sad because we had a chance, but didn’t take advantage of it." 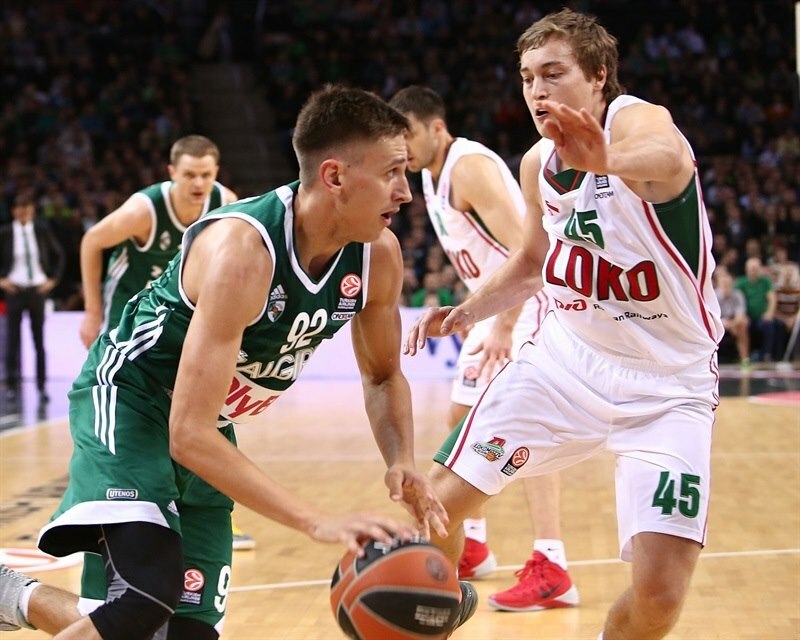 It’s very important to beat a tough team like Zalgiris Kaunas on the road. I don’t think we played our best game, but we did everything to win. We need to limit turnovers at the end of the game. We moved the ball well. I think everything we wanted to do offensively we did, but defensively we didn’t play our best game. There was good atmosphere in Zalgirio Arena and people understand basketball. Their fans support the team no matter what. This is one of the best places to play and to get a win here is pretty good.